Stylish, compact and boasting the latest in laundry technology, Beko tumble dryers deliver clever tumble drying – and are energy-conscious too. Available in condenser, vented and heat pump models, you’re sure to find the right tumble dryer from our range for your home. The Beko tumble dryer range includes vented dryers alongside condenser dryers that don’t require venting. This means there’s no need for pesky tumble dryer hoses, giving you the freedom to place your tumble dryer anywhere you like. 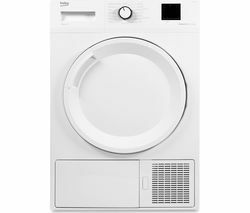 Dryer capacities ranging from 6kg to 8kg, and finishes including classic white, sleek silver, and bold black, so whatever your style, you can find a Beko tumble dryer to suit. Choose from a wide selection of drying programmes that make drying easier and more eco-friendly. A clever Sensor Drying system monitors temperature and levels of moisture, automatically stopping the drying cycle when your laundry has reached your pre-selected level of dryness. Reverse action tumbling reduces tangling and the need for ironing. And Beko tumble dryers come with a 24-hr timer delay function to fit your drying into your daily schedule. From delicate garments to the everyday family wash, Beko tumble dryers care for your clothes and cut down on energy use, while making laundry easy. 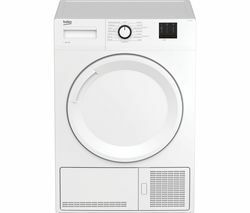 For an even wider selection of dryer styles and sizes, check out our full range of Hotpoint tumble dryers and Bosch tumble dryers too.